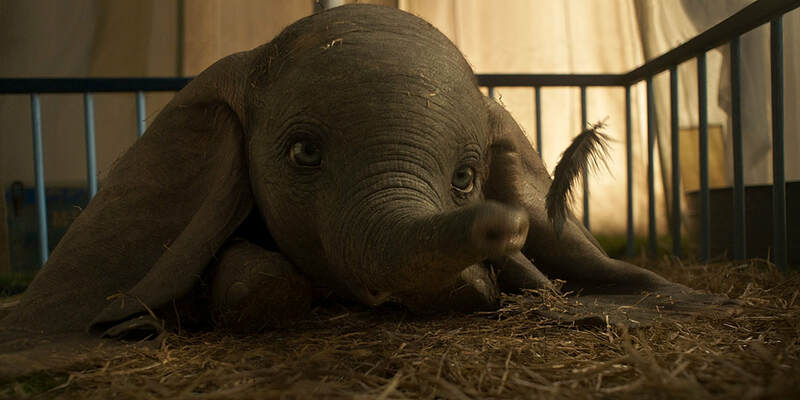 THE STORY - Struggling circus owner Max Medici enlists a former star and his two children to care for Dumbo, a baby elephant born with oversized ears. When the family discovers that the animal can fly, it soon becomes the main attraction -- bringing in huge audiences and revitalizing the run-down circus. The elephant's magical ability also draws the attention of V.A. Vandevere, an entrepreneur who wants to showcase Dumbo in his latest, larger-than-life entertainment venture. THE GOOD - Danny Devito and Michael Keaton give fun and silly performances in a remake of a Disney classic that will probably interest Disney fanatics and kids of a certain age. ​​​​​Disney’s live-action remakes of their classic animated films have been hit or miss so far. Not only in regard to audience reactions, but also in execution. Some, like “Beauty and the Beast” hew close to Disney’s original version, while others have a more unique take with their screenplays. Tim Burton’s “Dumbo” is one of the latter, which is to be expected considering the director and the content. The bones of this new film could make for an interesting reimagining of the Dumbo story, but the screenplay, dialogue, and visual effects don’t allow for it to live up to its potential. ​Set in 1919, “Dumbo” opens with two children, Milly (Nico Parker) and Joe (Finley Hobbins) Parker, waiting at a train station for their father Holt (Colin Farrell) who is returning from World War I. He arrives, now missing his lower left arm, to find that his wife has passed away and the circus where they were employed is falling into disrepair. In an effort to save it, the owner Max Medici (Danny DeVito) has put the last of the money into a pregnant elephant. Unable to perform his previous act, Holt is given the task of caring for the elephants and before long Dumbo arrives with his giant ears throwing everything into chaos as the troop assumes that he will be seen as a monster instead of the cute baby animal they had hoped for. Joe and Milly are enchanted nonetheless and discover quite by accident that Dumbo can use his magnificently large ears to fly. ​When a disaster in the tent causes Max to sell Dumbo’s mother, the scientific-minded Milly devises a way to earn enough money for the circus to buy her back. They convince the adults that Dumbo can indeed fly and after one show the circus becomes famous and their circumstances seem to be looking up. This success draws the attention of the rich and mysterious V. A. Vandevere (Michael Keaton) who invites the whole circus to join his fantastic adventure park, a place where Dumbo can really shine. Unfortunately, it isn’t long before this beautiful world begins to show its darker side and Dumbo and the children find themselves in a whole new kind of trouble. With the title character being completely CGI, the style and visual effects in “Dumbo” were always going to be a key part to its success. Burton is known for his unique visuals and design, but this film feels like a pale imitation of his usual flashy creations. There are a few moments where his style shines through and makes you wonder what could have been, but most of the time the movie feels almost perfunctory, as though he was just going through the motions. This is exacerbated by the uneven quality of the CGI, with some scenes looking fantastic and others almost shockingly bad. Dumbo looks more like an animated idea of an elephant, which wouldn’t be a problem if the other elephants in the film didn’t look like the real deal, but since they do, it makes for a jarring comparison. Due to the poor script, most of the characters fade into the background of the story, with only a few standing out for one reason or another. Danny DeVito brings life to the screen anytime he appears with his warm but slightly sleazy Max Medici, and Michael Keaton hams up every scene with a ridiculous accent and over the top mannerisms. Unfortunately, the one who is supposed to be the emotional heart of the film Nico Parker, comes across as wooden and one dimensional, with her characters love of science being her only real personality trait. However, it’s difficult to tell if that’s because of bad dialogue and character design or her acting. One of the biggest problems “Dumbo” has is that it doesn’t seem to know what kind of story it wants to tell. It crams the basics of the original film into the first act and then spends the last two meandering through a paint by numbers kids adventure that doesn’t have the depth for older children but has a few too many scary scenes for the very young. It uses a wildly different story but randomly throws in a few of the iconic scenes from the original which ends up feeling like the film is checking off boxes instead of creating a cohesive narrative out of the old and the new. For those who love Disney films and are willing to look past the significant flaws, and for kids in the right age range, there is something to enjoy here. But for most this will probably feel like an unnecessary addition to the Disney library and another reason for them to abandon these live-action rehashes of beloved stories.